ABSTRACT: In the late summer of 2004, Integrated Ocean Drilling Program (IODP) Expedition 302, also called the Arctic Coring Expedition (ACEX), successfully drilled the first deep boreholes on the Lomonosov Ridge in the central Arctic Ocean. The well preserved fossil diatoms used here are from biosiliceous Unit 2 inHoles 2A and 4Aof middle Eocene age. In the lower part ofUnit 2, resting spores occurred abundantly with other fossil diatoms. 25 diatom resting spore taxa and five allied vegetative cell taxa are described in this study of ACEX samples. Moreover 11 diatom taxa which did not occur in these sediments are also described for comparison with the Eocene Arctic resting spores. Their biostratigraphic ranges are also indicated. 10 of the resting spore species which occur in the ACEX samples had already appeared during the late Cretaceous while the rest of them appeared in Eocene. 21 of 25 (84%) resting spore taxa became extinct during the middle Eocene to early Oligocene. Most resting spore taxa described in this study do not belong to Chaetoceros resting spores because they lack a single ring of puncta on the hypovalvemantle that characterizes the resting spores of Chaetoceros and became extinct before Oligocene, therefore it is clear that Chaetoceros did not flourish in the middle Eocene in the Arctic Ocean. Other diatom genera that produced resting spores such as Pterotheca and Pseudopyxilla, might have prospered before the Eocene/Oligocene boundary, although their vegetative cells are unknown so far. 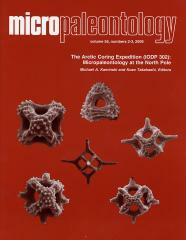 Since some Chaetoceros resting spore taxa are reported in this study, most coastal regions experienced regular seasonal environmental change, which benefitted genera such as Pterotheca, Pseudopyxilla and Odontotropis, but also there might have been some patchy coastal upwelling regions with nutrient depletion and sporadic supplieswhere Chaetoceros may have survived. The abundant dinoflagellate cysts preserved in middle Eocene ACEX cores provide evidence of stable conditions before the Eocene/Oligocene boundary. The resting spore ecology of most resting spore taxa before the Eocene may have been similar to that of dinoflagellate cysts rather than that of Chaetoceros resting spores after the Oligocene.